This is a wedding with a difference. Payman Aref is an imprisoned student who is currently one of those on show trial. Hence he can not be present on his wedding day. 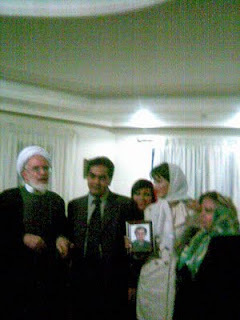 The bride and the bridegroom's family however have been welcomed in Karroubi the lion heart's home and the wedding ceremony is performed by Karroubi himself, while Payman had a one minute opportunity for a telephone conversation from prison. Karroubi will be remembered as a national hero in post-IRI history textbooks.